When a person files a chapter 7 or chapter 13 bankruptcy case, there is the immediate creation of the automatic stay. The automatic stay is the protection provided to the debtor which prohibits creditors from taking specific collection actions or other efforts to collect on a debt. Sometimes the notice of the automatic stay will come directly from the debtor’s attorney via fax, email or mail. For most creditors, the automatic stay will come via US mail sent by the clerk of the United States bankruptcy court. If there is an urgency such as a wage garnishment or bank citation or other court action, the debtor’s attorney will typically send that notice directly to the party taking such action. In a recent chapter 7 bankruptcy filing, the debtor was being pursued by a former landlord who had obtained an outstanding monetary judgment. This past landlord was very aggressive in attempting to collect the debt. The landlord had already sent a third-party citation to the debtor’s bank. The landlord had also gone back into court in an effort to amend the judgment for additional damages. The landlord had also sent a wage garnishment notice to the debtor’s current employer. All of these actions helped trigger the debtor into deciding to file a chapter 7 bankruptcy. Once the bankruptcy case was filed, notice was sent to all creditors with a special notice sent to the prior landlord. A notice was also faxed to the debtor’s employer so that no future wage garnishments could be had. Interestingly, the prior landlord called the debtor’s law office once she received the notice inquiring as to what she could or could not do. The prior landlord was notified to seek her own counsel, abide by the automatic stay and to stop all collection efforts. Despite this admonition and despite the clear purpose of the automatic stay, the prior landlord continued to contact the debtor’s payroll department in an effort to have wages garnished and to have funds turned over to her. This is quite obviously an egregious stay violation. In fact, it took the director from the debtor’s company to contact their own legal department to determine whether or not they should or should not garnish the wages despite the fact that a chapter 7 bankruptcy case was filed. This muddying of the waters occurred solely due to the fact that the past landlord was pushing the garnishment despite the fact that a bankruptcy case was filed. What will likely happen here is that a motion for sanctions will be brought against the prior landlord for purposeful violation of the automatic stay. The debtor will have to prove what damages she suffered as a result of such conduct by the landlord. The court will likely not be kind to the landlord. The court will understand that the notice was sent, the debtor’s counsel had actually spoken to the landlord with regard to stopping collection efforts and the landlord went ahead and contacted the debtor’s payroll department on numerous occasions in an effort to collect a debt. I would not be surprised if the bankruptcy judge sitting in Lake County, Illinois issues a monetary sanction in favor of the debtor and against the landlord in a sum of $2,500.00. Bottom Line: If You Receive Bankruptcy Notice, Leave The Debtor Alone! The take away from this article is that bankruptcy protection is powerful. If you are a creditor and you receive an automatic stay or other notice regarding a bankruptcy, you must adhere to it. You do not have the right in most circumstances to continue to pursue the debtor in an effort to collect a debt. If you are unsure of what to do when you receive a bankruptcy notice, then contact a bankruptcy attorney for help. 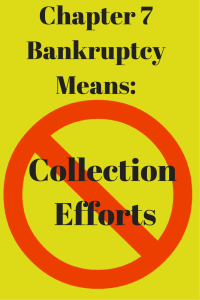 If you seek to go it alone and continue to collect on a debt that’s part of a bankruptcy, you do so at your own peril. The bankruptcy courts have and will continue to issue sanctions against those that violate the automatic stay and against those that violate the tenants of the bankruptcy code.